The paths we choose in life have a major impact on everything we do. This remains exactly the same when we go fly fishing. Take a look beside most popular rivers and over the course of a season, two distinct paths form year in year out as shown in the image above. When viewed like this, it’s easy to see that moving up and down a river via the “Anglers Path” results in you catching more fish. 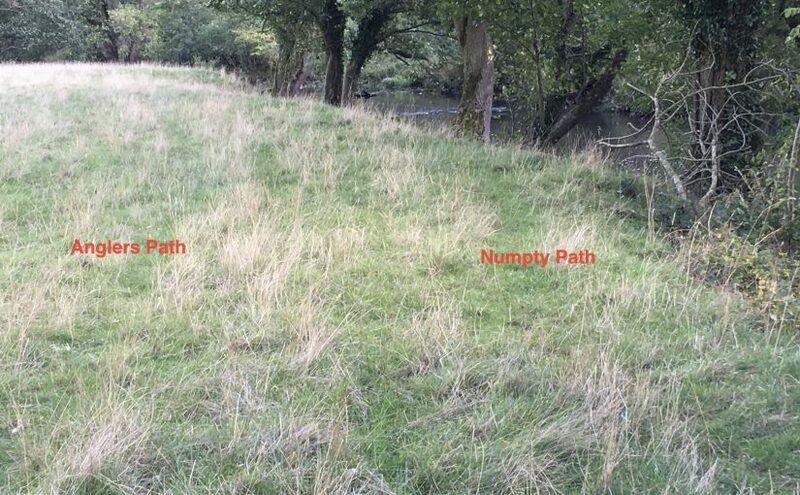 Taking “The Numpty Path” ensures you spook the majority of your quarry before ever unhitching a fly from the keeper ring! Taking a position on the numpty path stealthily to observe or fish from. Scouting a piece of water you are unfamiliar with and not planning to fish immediately. We get over excited and go charging along the river looking for a “big un”! Typical of early season, a special trip or anytime you’ve not fished for a while. Overcoming this tendency will help you hugely make your precious, limited fishing time more productive. We become too focused, it starts meaning far too much and the net result is we get clumsy and make mistakes like getting too close. Finally not taking into account other anglers and walking too close, impacting their fishing. The odd accidental stumble across an unseen comrade is allowed providing an immediate and honest apology is made. Continual uncaring stomping along the bank with no consideration for others, means you are a complete numpty! Sort yourself out.